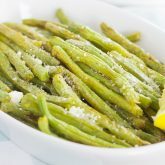 This Roasted Lemon Parmesan Asparagus is a simple and easy side dish that’s packed with flavor. 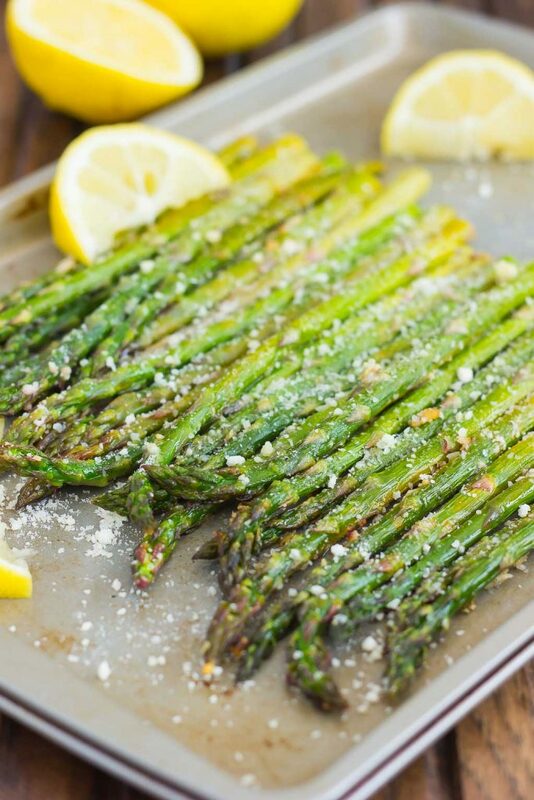 Fresh asparagus is roasted to perfection and season with lemon juice and Parmesan cheese. You can have this vegetable prepped and ready to be devoured in less than 20 minutes! Happy Tuesday, friends! Did you all have a relaxing three day weekend? My weekend was nice, but not very relaxing, because the hubster and I moved into our new house! But I’m not complaining about the lack of down time, as I’ve been counting down the days for this past weekend for-evvvver. We officially closed on our house last Friday, so were up bright and early moving on Saturday. We’ve got tons of space, a big basement, a gorgeous kitchen with an island, and nice backyard…I could go on and on, but I’ll stop now! Anyways, now that Memorial Day weekend has come and gone, I’m really getting the itch for summer! In my mind, it’s officially summer, even though it’s still technically spring. The weather is warm, schools are out for the next few months, and I’m dreaming of cold drinks and warm nights spent outside. And in between my thoughts of summer fun comes some delicious produce. I love visiting farmer’s markets during the the warm months, and I often stock up on lots of asparagus. And since it’s a favorite of the hubster and I, we eat it quite often. Here at Pumpkin ‘N Spice, my motto is “Where easy meets delicious.” And I really mean that! This fresh veggie is such a simple side dish, but it’s bursting with so much flavor. And really, you can’t get much easier than this. This Roasted Lemon Parmesan Asparagus takes less than 5 minutes of prep time and about 10 minutes in the oven. In just minutes, you’ll have this green vegetable ready to be devoured. And that’s perfect for warm, summer nights, because that’ll save you time in the kitchen. And did I mention that this is made in one pan, and one pan only? Simple toss the asparagus in some olive oil, salt, and pepper. Then squeeze some fresh lemon juice on top, followed by some Parmesan cheese. Pop the pan into the oven and let it work it’s magic. The result? Tender asparagus that’s crisp on the outside and tender on the inside. It has just a hint of lemon flavor and is coated with Parmesan cheese. You can’t get much better than that! 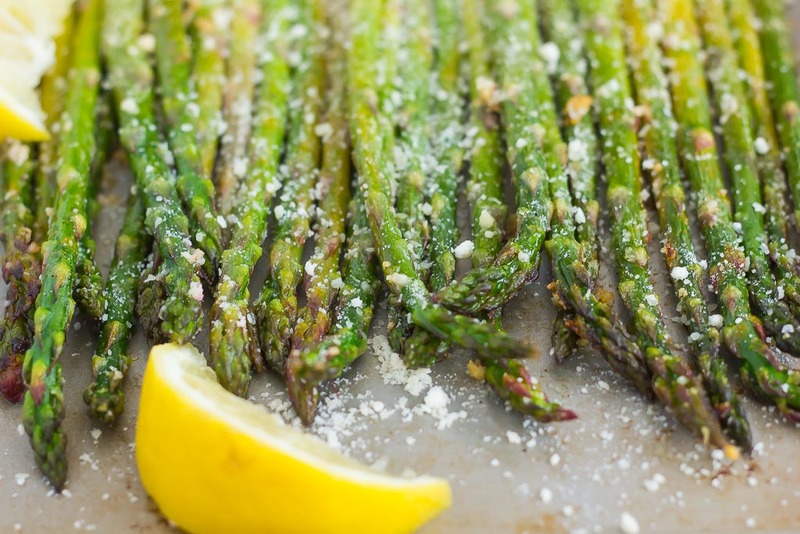 So grab that fresh asparagus and whip up this easy, Roasted Lemon Parmesan Asparagus! I guarantee it’ll be your new favorite summer side dish! Looking for more side dish recipes? I’ve got you covered! 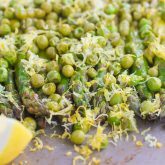 This Roasted Lemon Parmesan Asparagus is a simple and easy side dish that's packed with flavor. 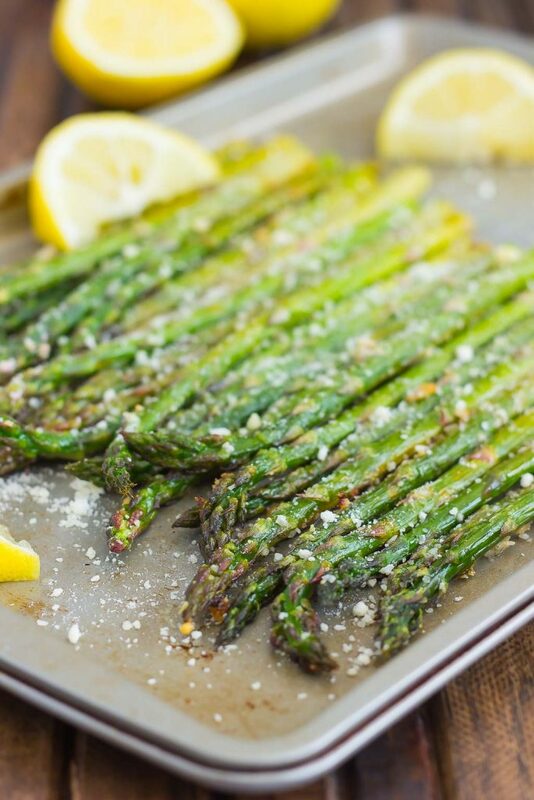 Fresh asparagus is roasted to perfection and season with lemon juice and Parmesan cheese! Preheat oven to 425F. Line a large baking pan with parchment paper or lightly coat with non-stick cooking spray. 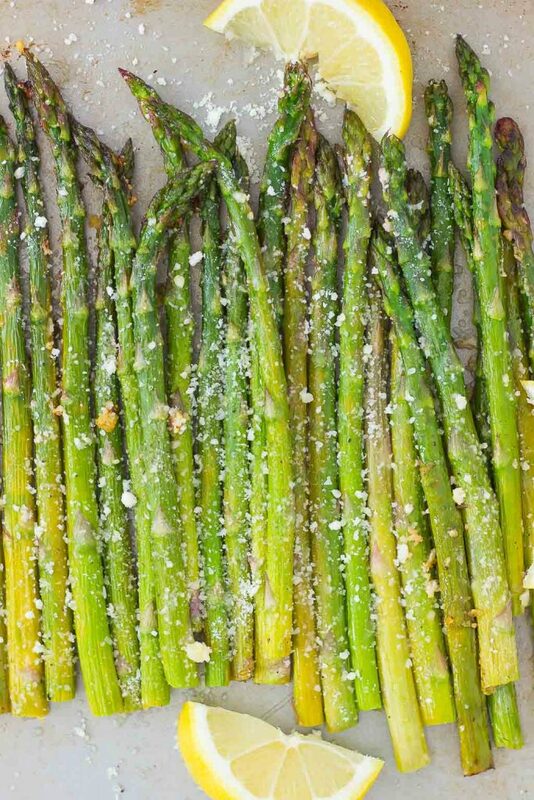 Arrange asparagus on an even layer on baking pan. Drizzle with olive oil and season with salt and pepper. Toss to coat the asparagus. Drizzle lemon juice over asparagus, followed by 1/4 cup Parmesan cheese. Bake for 8-10 minutes, or until asparagus is crisp on the outside and tender on the inside. Remove from oven and top with remaining 2 tablespoons Parmesan cheese. Congrats on your new house! That's so exciting!! You're adulting for reals now. :) And asparagus is my go-to veggie. With parm it can't be beat! Congrats on moving in to your new house! I know you must be excited! As I'm super excited about this asparagus ;) Lemon is the best addition! Thank you, Megan! I agree, lemon is the perfect touch for asparagus! Gayle - Summer can't come faster! I got a taste of it this weekend, and I can't wait for freedom. While I'm anticipating the start of summer and the end of the school year, I'll make some of this asparagus. It looks delicious and so fresh! Asparagus just seems to taste better in the summer...it's so fresh and flavorful! I hope you love this if you try it, Erin! Congrats on the house move - that's so exciting. A kitchen with an island is even more exciting! I love roasting asparagus with lemon - I even snakck on it. Thanks, Dannii! I am SO excited about my kitchen with an island! :) And snacking on asparagus sounds like a great idea! I'm so glad your move went well! Congrats on the new house, Gayle! I reaaaaally wanna see pictures of this kitchen too! ;) Also, I'm totally the weirdest person ever but I TOTALLY want this gorgeous roast asparagus for breakfast. It is absolutely making me drool!! Congrats on the new house!!!! I hope you show photos! and love this, this is one of my fave ways to eat asparagus!!! Thanks so much for the kind words, Alice! Congrats on the new house! I hope you're able to settle in quickly and smoothly! Roasted asparagus is my favorite! Love the lemon parmesan combo! Thank you for the asparagus love, Jessica! Congrats!!! A new house!!! That's so exciting! And this asparagus sounds dreamy...the perfect spring side! Congrats on your new house!! That's so exciting. Enjoy the process of getting settled in and decorating. This asparagus sounds wonderful!! Congrats on the new house Gayle! A New kitchen with an island sounds awesome! It is perfect that you moved at the beginning of summer, you can organize the house, while the weather is still nice! These roasted asparagus look fresh and delicious! Can’t wait to make some! Congratulations on the move! That's so exciting! Who could say no to a side that only takes ten minutes in the oven? Roasted asparagus is wonderful. And the lemon sounds great! Thanks, Amanda! 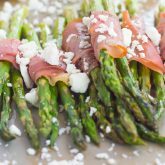 Asparagus is my go-to veggie, especially in the summer! Congrats on being in your new house and good luck with unpacking! I know it's not fun, but once you're settled in it will be so nice, right? :) And I LOVE asparagus! I could eat this whole pan myself Gayle -- I love the lemon and parmesan! Thank you, Marcie! Unpacking definitely isn't the best, but I'm so excited to finally get everything organized! Thank you, Annie! I love the looks of asparagus...so fresh and crisp! Thanks for the asparagus love, Kelly! Congrats on your new house Gayle! That's so exciting! I love asparagus with lemon, so good! This looks delicious! Roasted asparagus is one of my favorite summer side dishes! This version looks just amazing! Thanks for the asparagus love, Keri! So exciting that you're all moved!!! Big congrats on the new house :) and YUM about this asparagus - lemon and parmesan make every vegetable so much better! Yay for moving into a new house! I'm so happy for you, Gayle! 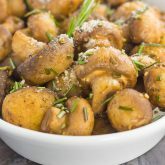 I'm also happy that you posted this recipe, because I need some more veggies in my life. Anything with parmesan is always a winner in my book! ADORE ADORE ADORE!! Roasted vegetables, especially asparagus = THE BEST! Thanks for the asparagus love, Gigi! Currently cracking up laughing at how we almost posted the same thing today! Great minds! I didn’t add parmesan and lemon, but I love you did. Awesome recipe . Thanks for sharing Gayle! Thanks for the kind words and for stopping by, Jennifer! Thanks for the asparagus love, Nadia! Have made this often. I and everyone I serve it to loves it. Hi Lois! I'm so glad to hear that! Thanks so much for stopping by and letting me know how it turned out!